Next time I have a bright idea I’m going to figure out the energy required before I decide to go with it. It takes energy to control energy. Not as much—an exchange teleport, where I’m swapping two things of equal mass, doesn’t take anything like the actual potential energies involved. But it does take something. Quite a lot, when I’m exchanging that much mass over that much distance. Rainbow has been astounded at the amount I’ve had to eat. The place I had in mind as my ice field seemed even better on a second look. It was once a pond, but the water cut through a ridge of gravel and cinders to drain to the lake. The drainage channel is conveniently located, and can easily be bridged by a couple of palm trunks. I had to abandon the tabular iceberg idea because of the salt near the base of the drift ice, but a chunk of land ice from the island, upwind of the volcano (which is still erupting) seemed a reasonable substitute. What I had not calculated in advance was the sheer mass of ice it would take to replace the mass of silt I removed from the former pond bed. I wound up doing exchange teleports of partial ice masses and silt over two days, with frequent breaks to eat. About half of the People had arrived by the time I added the top layer of snow and staggered back to my home to demand more food from Rainbow. The sun rose this morning at 7:31, and will set after 12 hours and 52 minutes, at 8:24 this evening. We’re gaining 6 minutes 44 seconds a day, and the sun on the snow near noon is blinding. I regret to say that while it may be spring officially, there is no melting in sight here. 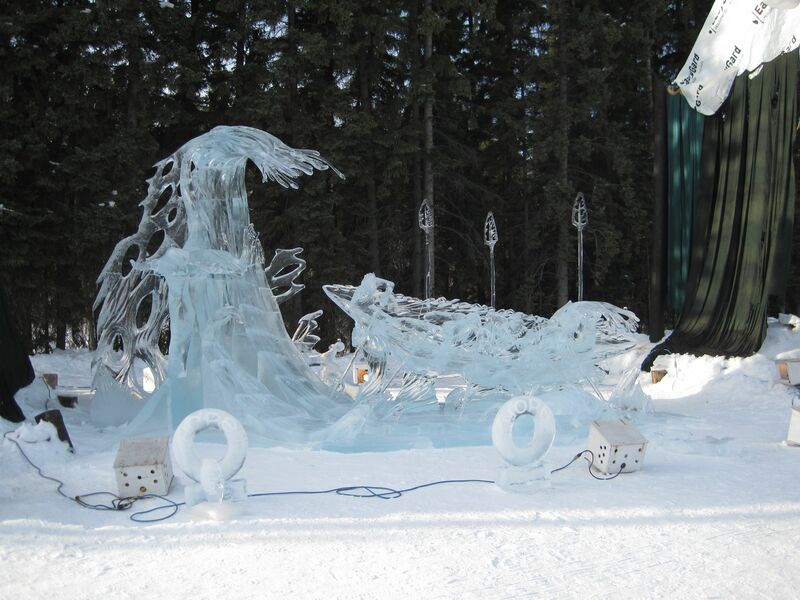 For the ice park, this in wonderful. I personally am a little tired of almost 2’ of snow still on the ground, with more snow today. (It was snowing when I went to bed last night, and by 8 this morning we’d accumulated another 3″.) Still nothing like I hear the middle of the lower 48 is getting, though the south coast of Alaska is scheduled for a foot or more. 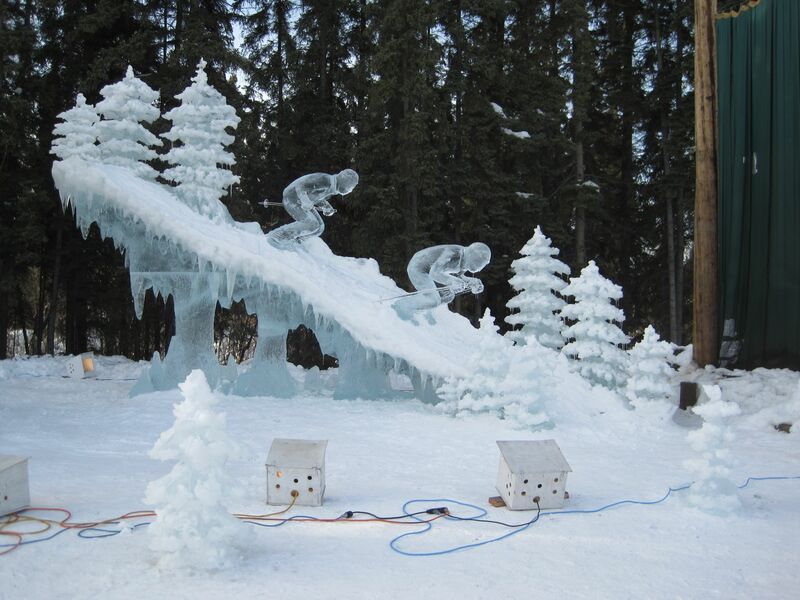 Speaking of the ice park, I went through the Youth division Friday. This division is for artists through 18 years of age. I’d say they did a pretty good job. Stargate, 2nd Place Youth division. Artist Tane Timling. 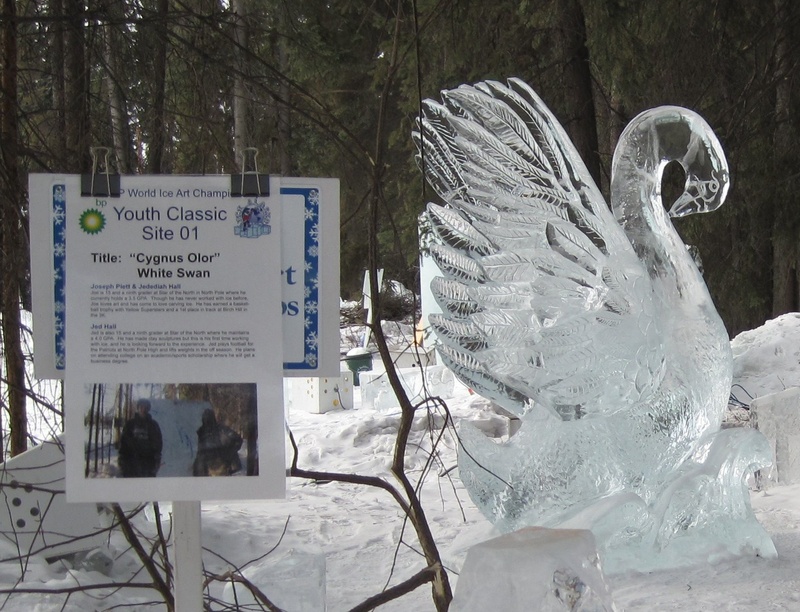 Cygnus Olor, 3rd place Youth Division. Artists Joe Plett and Jed Hall. The sun rose this morning at 7:57 am – past tense, again! It will set 12 hours 5 minutes later, at 8:02 this evening. With the sun 24° above the horizon at noon, and the ground well-covered with snow, it is getting quite bright during the day. No real warming yet; we’re getting into the teens in the daytime and 10 to 20 below at night. What, 12 hours, and the equinox is not until 3:02 in the morning Wednesday? Well, sunrise and sunset are calculated when the upper rim, not the center, of the sun is on the horizon, and the refraction of the atmosphere must also be taken into account. Suffice it that today the day is slightly longer than the night. Writing? I need to do some major revisions (still in the thinking-out stage) in Rescue Operation, and write the rest of my A to Z blogs. I’ve just finished L, and hope to get through P this week. (I’m introducing characters and background from my books.) My OLLI classes will increase to 6 a week in April, and I expect to be very busy. Thank goodness they don’t require homework, but it’s a half hour drive each way. 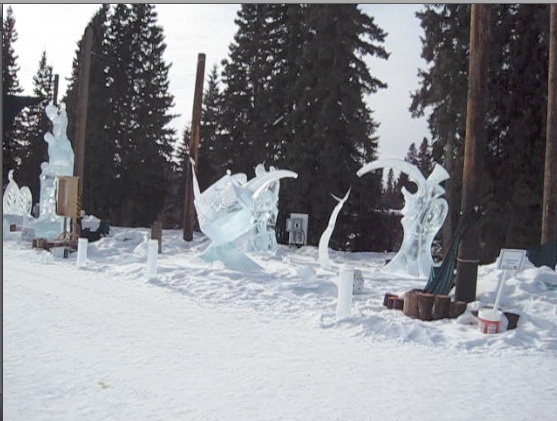 I’ve been getting out to the ice park, and I’ll have more photos Tuesday and Thursday. For today I’ll post a pair that aren’t really sculptures, but part of the festivities the evening they announced the winning artists, and lit a bonfire to celebrate. 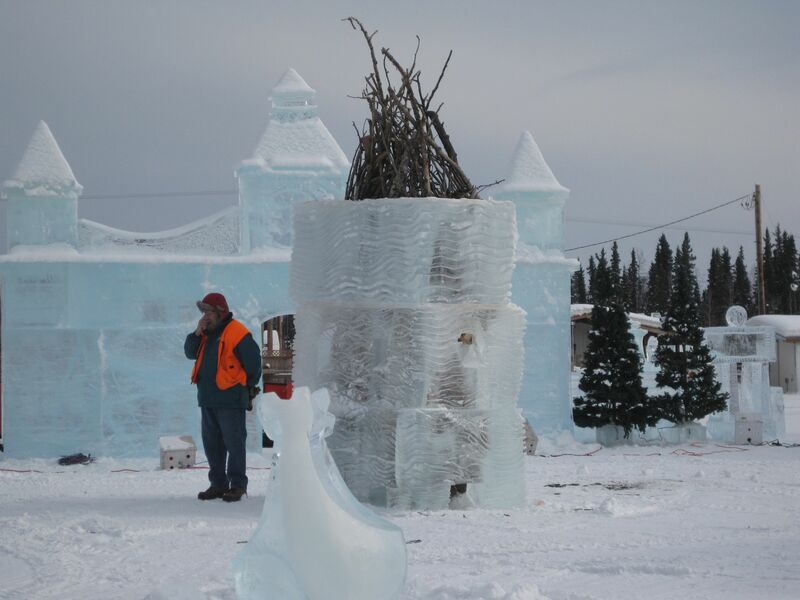 I saw the bonfire site earlier – branches surrounded by a column of ice walls, with vents to allow plenty of air to reach the blaze. The surprising part was how much of the ice walls were left a week after the fire. It’s definitely still winter here, however brightly the sun is shining. Reminder: Horse Power is FREE on Amazon through midnight Pacific Time today. 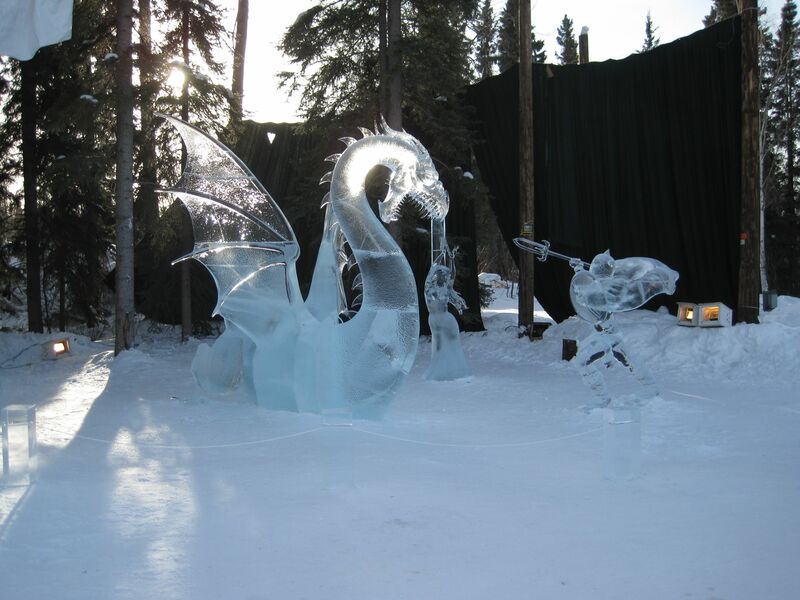 Here are the top two winners in each category (realistic and abstract) of the multi-block competition of the World Ice Art Championships. I have to say some could fit either category. I am surprised (and pleased) at how well the USA did this year. Hunting Dragons, 1st place realistic. Steve and Heather Brice and Steve and Justin Cox, USA. The sun will rise at 8:23 this morning – note that it’s back to future tense, thanks to daylight savings. On the other hand, with an 11 hour 18 minute day, it won’t set until 7:40 this afternoon, with solar noon at 2:01 pm. Alaska’s certainly not on sun time, and it’s even worse at Nome, where the sun sometimes doesn’t rise until afternoon. The temperatures have been balmy to the point of being ridiculous . 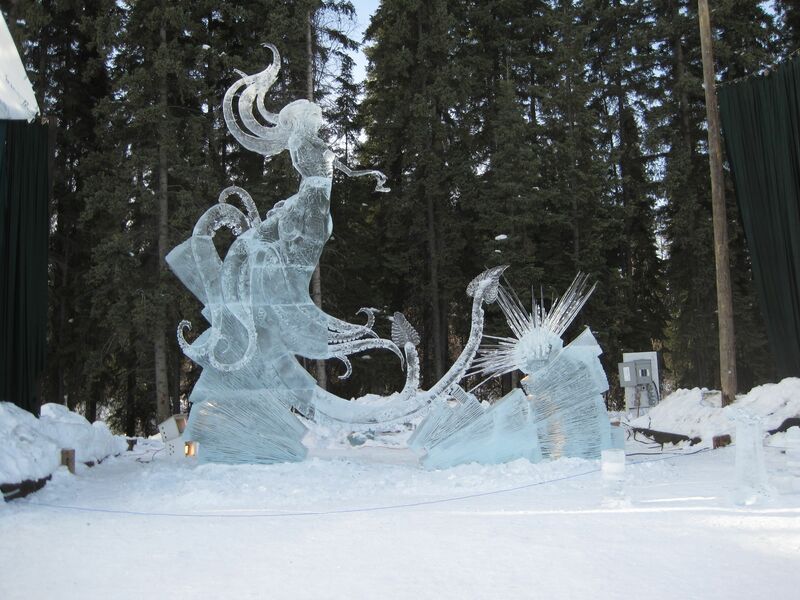 The highs were above freezing from Thursday through Saturday, which caused problems for the World Ice Art Championships. 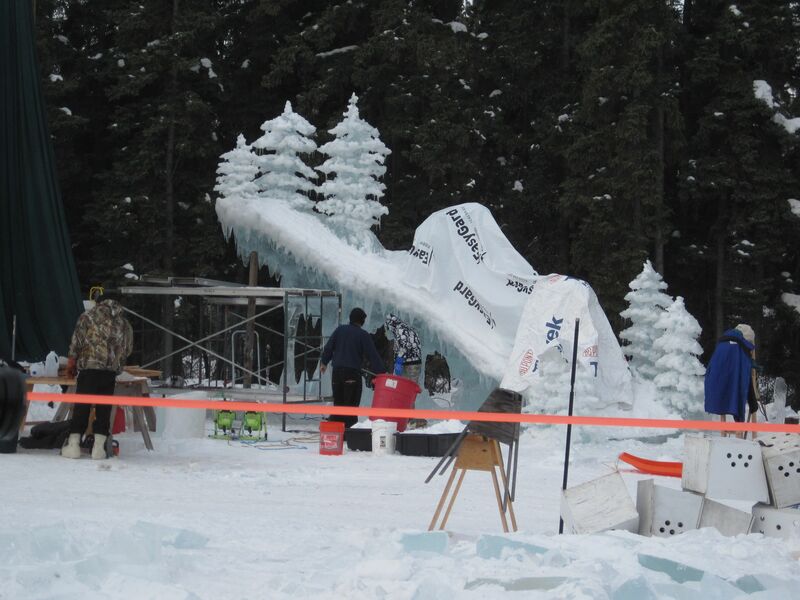 The single block competition was over, but the multiple block carvers were supposed to finish at 9 pm Friday. They use water to glue the pieces together, and at 42° Friday that just wasn’t possible. 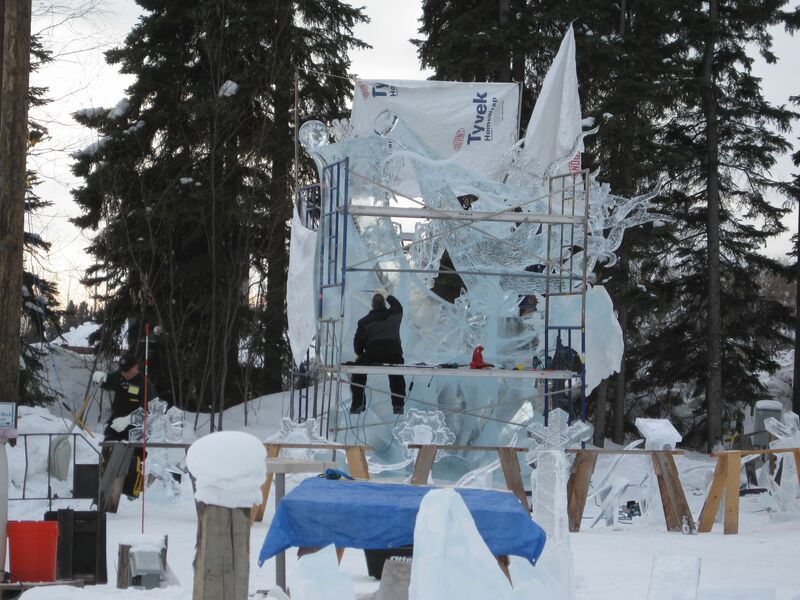 So Friday most of the sculptures were wrapped in Tyvek to keep the sun from melting them, and the sculptors were allowed to keep working until 11 pm. The roads are great where the sun has melted the ice and then evaporated the water, but there is still a lot of gray ice present. When the sun shines on that, with temperatures this warm, it gets very slippery. 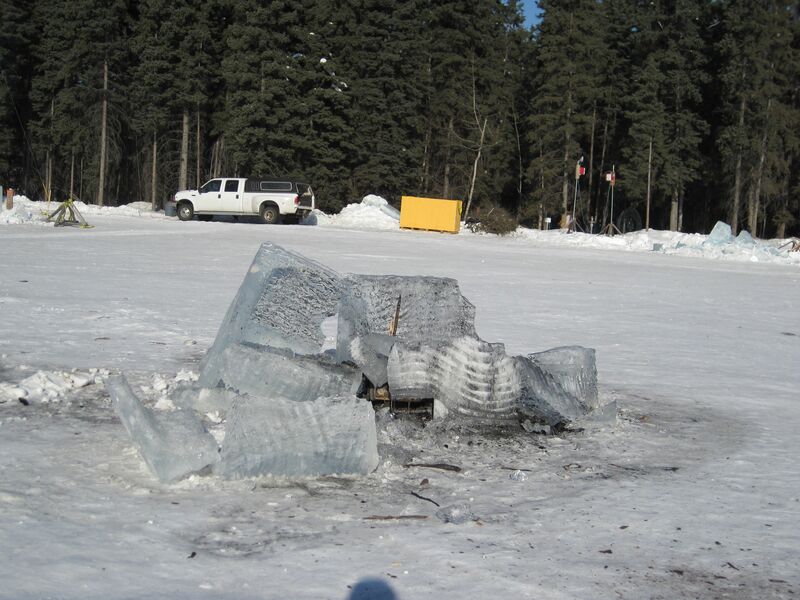 Remember the ground is thoroughly cold-soaked, so it takes quite a lot of heating to get rid of the ice cover. I hope it stays below freezing for a while now, but I’m not hoping for extreme cold, such as sometimes follows unusual warmth. We can reach 40 below until the end of March. I’ll put a couple of pairs of photos side by side below. Click to get larger images. The first is Friday and Saturday views of “Winter Breeze,” an abstract by Stan Kolenko, Chris Uyehara, Jerry Perun and Wei Sen Liang, all of the USA. Guess I did a good job choosing; this one took first place in the abstract category. 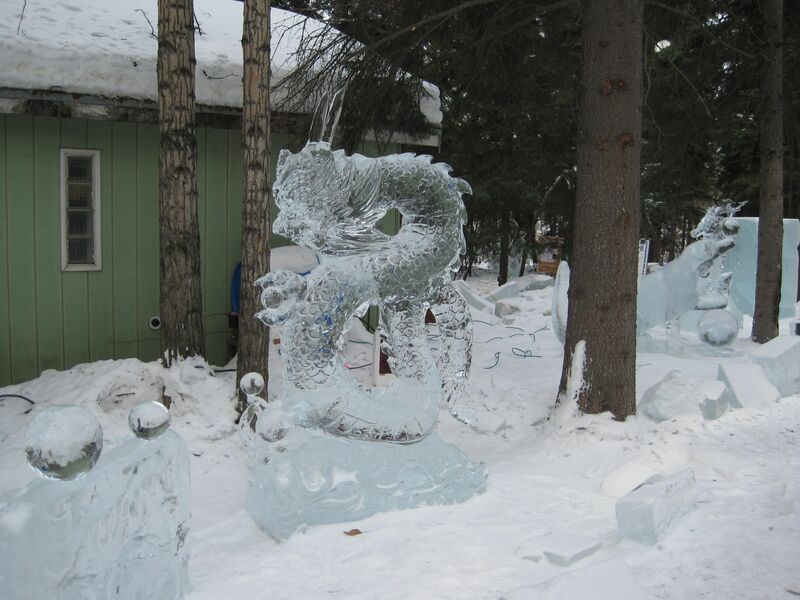 The second is Friday and Saturday views of “Extreme Ice,” a realistic sculpture by Qi Feng An, (China) Di An, (China) Julio Martinez (Mexico) and Aubrey Newton (USA.) This one took 4th place realistic and the Governer’s Award. I’ll post photos of the winners Thursday. WildDog is teething. So am I. His mouth probably hurts more – I’m merely replacing a worn-out molar which is just about ready to fall out. There’s not much actual cutting involved, though the loosened tooth is a problem, and my bite will be uneven for some time. His tooth, an incisor, is working its way through the gum, and from the crying he is doing, it hurts. I took Giraffe aside and explained what was happening, and he seemed considerably relieved to know it was normal and not a sign that his son was becoming a weakling or a coward. I also levitated – carefully – into the anvil of a thunderhead and collected a grass basket of ice crystals. They use hides rather than woven stuffs for the most part, but WildDog seems quite content to chew on a thin piece of hide wrapped around a handful of ice crystals. I can even store the crystals, as I do frozen meat. Come to think of it, I could actually make ice with the heat pump. But I don’t really want to do it when the whole group is here; I’d be doing nothing but making ice for teething babies! Songbird, Giraffe and Meerkat are all fascinated by the solid crystals that melt into water, and astounded that clouds have such stuff in them. I thought of explaining that the crystals are the seeds that make raindrops, but had second thoughts. I have already given them far too may ideas; there is no excuse for going further than necessary. Jarn is a human-like alien who was stranded in Africa some 125,000 years ago. His story to date is on my author site, and is part of the remote background of my science fiction universe. 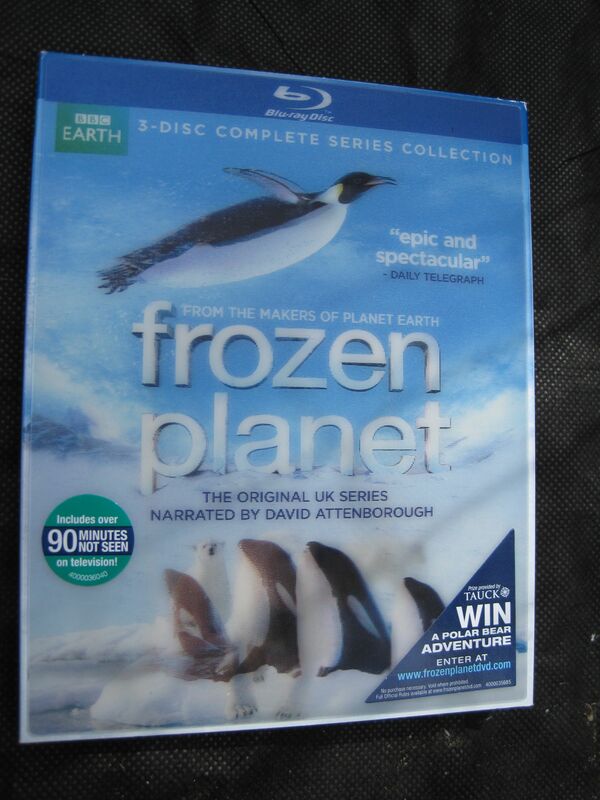 When I heard that the BBC was making a documentary about the Earth’s high latitudes, Frozen Planet, I knew I had to have the DVD if they made one. When stories appeared that the part on global warming would be cut for US audiences, I was horrified – and relieved when the Discovery Channel relented – at least partly. Since I do not have cable or satellite TV, I had to wait for the DVD. Finally it arrived and I have been watching it – when I have time between gardening, marketing and writing. As you may have guessed from previous reviews, I adore David Attenborough and really don’t understand why so many of his nature programs for BBC have been released in the US with different narrators. The first episode is a general overview, followed by one for each of the four seasons – but the seasons used: spring, summer, autumn and winter, are not the seasons as usually defined. In fact they are not well defined, but appear to be based on the weather rather than the usual spring = the period from the northward equinox to northern solstice in the northern hemisphere and from the southward equinox to the southern solstice in the southern hemisphere. Roughly, they seem to define the period of continuous (or at least very long) daylight as summer, that of continuous or very long night as winter, and the period of alternating daylight and dark as the transitional seasons – but even this is not well followed. 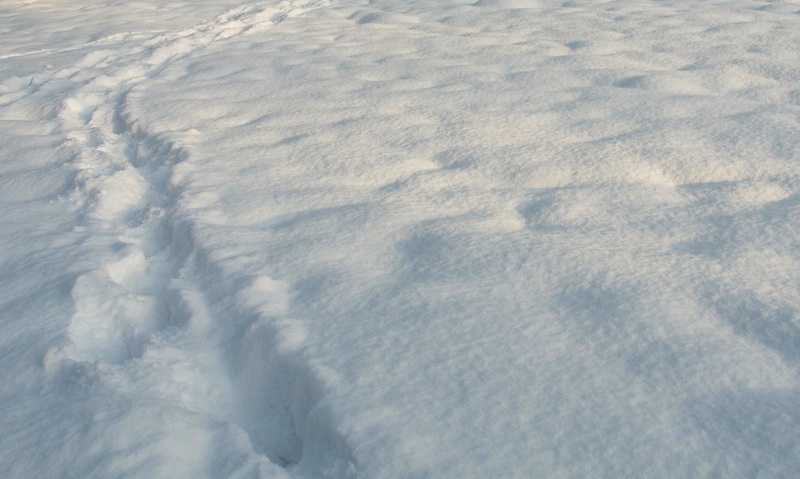 Other ways of dividing the seasons may be the waning, absence, reformation and solidity of sea ice, or the melting, absence, buildup and universal presence of snow. All seem to be used to some extent. These first five episodes are almost entirely about the natural world: the wildlife, the weather, the geography. The sixth program is about how humans interact with the polar regions. Our species evolved in the Ice Age, so it is hardly surprising that we invaded the northern parts of the continents almost as soon as we could reach them. Two domesticated or semi-domesticated animals made this spread to northern climates possible: the dog and the reindeer. Early migrants and their descendants today relied heavily on the polar oceans, as agriculture of any kind is difficult in permafrost country (though I was a little surprised that permafrost was never really mentioned.) There was little mention of wild plant foods, though in fact berries and other wild plants are definitely part of the arctic diet, and the arctic in spring and summer has high productivity, as indicated by the number of migratory birds that breed at high latitudes. Today human interactions – and impacts – are more often focused on resource extraction. Antarctica has had quite a different history. Undiscovered until relatively recently, its fauna has evolved with a lack of land predators that could make it very vulnerable. Luckily Antarctica is protected by international treaties so most of the human activity there today is scientific research. But how long will that remain true as our appetite for resources increases? The seventh program is the “controversial” one. I’m not sure what the controversy was supposed to be about. The program shows observations at both ends of the Earth that demonstrate the thinning and melting of sea ice in the Arctic and collapse of ice sheets, which may act to buttress glaciers draining the interior, in Antarctica. The importance of enhanced glacier calving to sea level rise was touched on. The cause of this warming might be controversial, as is the use of weather records to observe it, but these were not even mentioned. Just the observed changes, and their possible impact on both the human inhabitants and the animals of the polar regions. As an atmospheric scientist for most of my professional career, the only thing I considered even remotely controversial was the lack of any mention that human activity might in any way be responsible for the observed changes. Somehow I don’t think that was what had Discovery Channel worried. Most of the rain that falls over the continents started out as snow or hail. It may be quite warm by the time it reaches the ground, but it started out as ice. Aftermath of an ice storm. 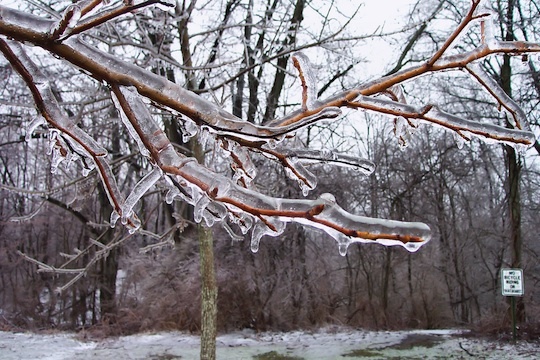 The raindrops were supercooled, and froze as they struck the twigs. Cloud droplets, it turns out, do not coalesce easily. Most of them, especially in continental clouds, are so small that the air keeps them from actually colliding. The result is that most continental clouds do not rain unless they are tall enough to reach well above the freezing level. But what if ice and liquid water are both present in a cloud? No, that’s not impossible. Water can exist as a liquid at temperatures below freezing. 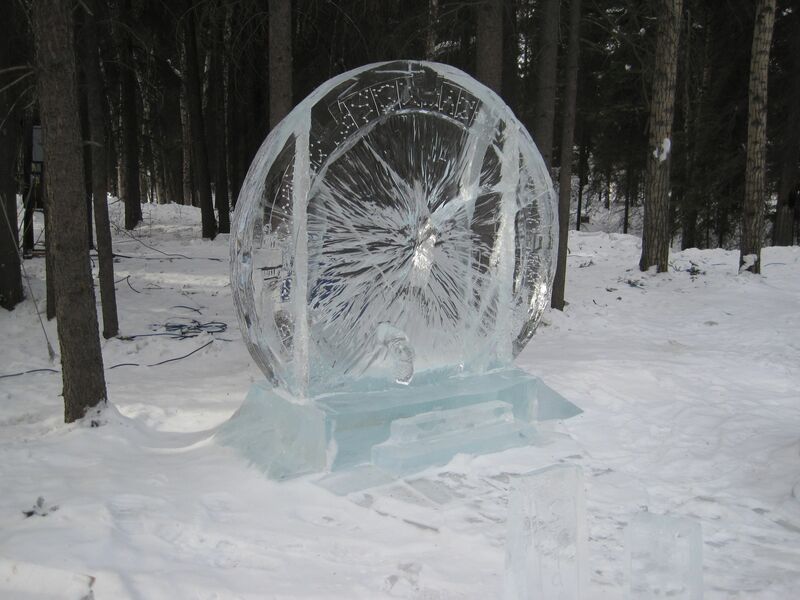 It’s not stable, and any small particle around which ice can form will result in rapid freezing, but such particles are rare in the free atmosphere. They do, however, occur. Furthermore, they are activated at different temperatures, and the colder the air, the more particles that can act as freezing nuclei. 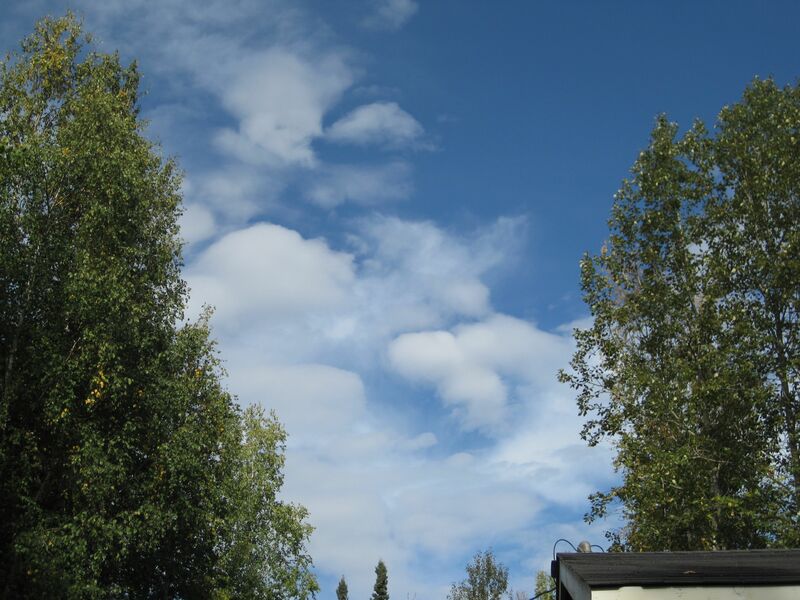 At temperatures below freezing but above about -15°C (5°F) such particles are rare enough that most clouds are made up of supercooled water droplets. These are the temperatures at which pilots dread having to go through clouds, because the plane acts as a giant freezing nucleus and any droplets that strike it are instantly turned to ice. 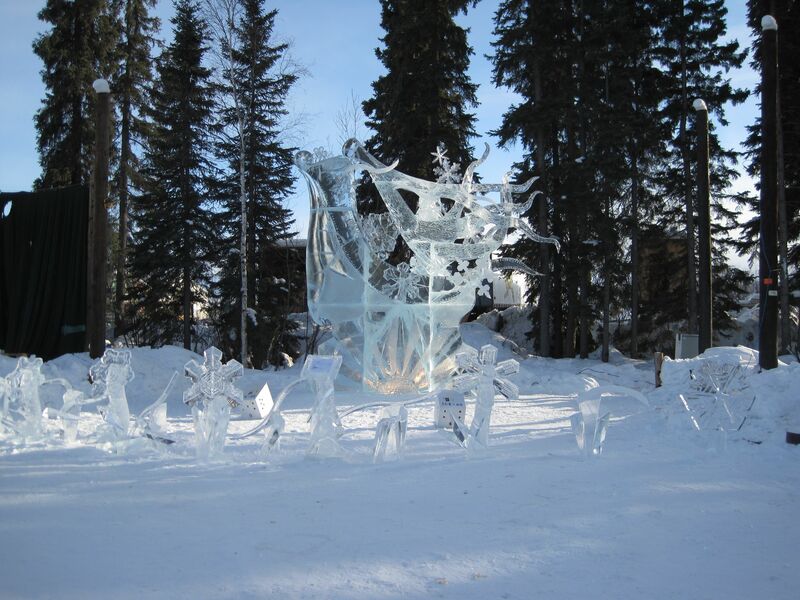 Below about -20°C (-4°F) there are generally enough ice nuclei that the cloud is made up of ice crystals, or glaciated. 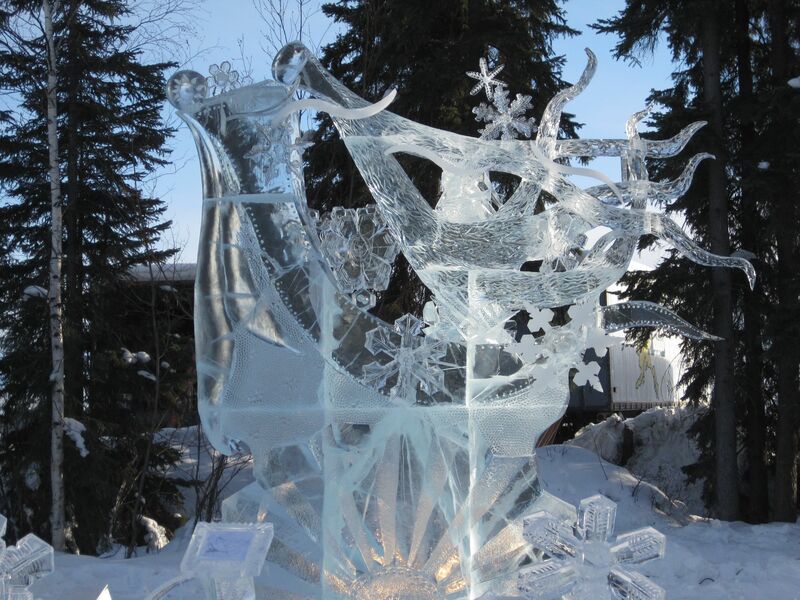 What happens if both ice and supercooled water are present? Water evaporates more easily than ice at temperatures below freezing. 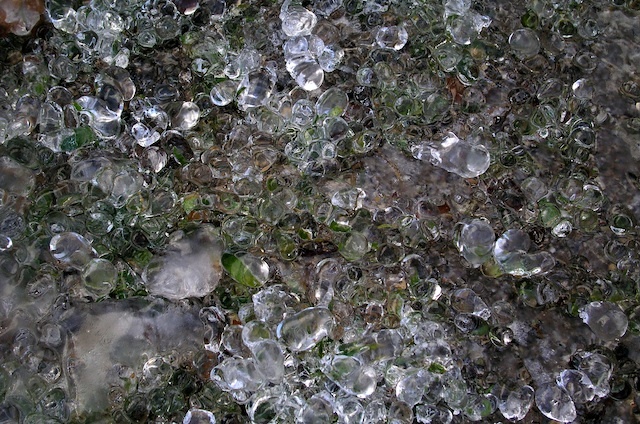 The result is, water evaporates from the supercooled droplets and condenses on the ice crystals, which grow rapidly at the expense of the droplets. Since they grow more rapidly, they begin to fall faster, and accumulate still more water droplets by collision. If they get large enough to continue falling into the warmer air below the freezing level, they will (usually) melt and reach the ground as rain. If there are really strong updrafts, as is often the case in a thunderstorm, they may actually be carried upward through the supercooled part of the cloud. They may collect several layers of ice, too much to melt once they fall out of the updraft. The result is hail. If there is a layer below the cloud which is warm enough to melt the snowflakes but the ground itself is below freezing, the result may be freezing rain. But in most cases freezing rain started out as snowflakes that thawed, but then fell back into colder conditions near the ground.